Watch out for wildlife that prey on pets, such as owls and coyotes—they are hunting constantly to feed their young during spring. Be protective. Small dogs, cats, puppies and kittens are particularly vulnerable. How many missing family pets have fallen victim to predation? Owls and coyotes are found everywhere on the North American continent, and they hunt to feed their young during the spring months. Both species have now habituated to suburban and even urban environments such as parks and industrial areas. Owls have been known to kill “… a kitten, two ducks, two chickens and a 20 lb. goose” in just two weeks during spring of 2009 at one East Texas hobby farm. Great Horned Owls are enormous, and if the animal fights successfully to free itself, it could die from the deep talon wounds anyway. These owls are nicknamed “tigers of the night” for their striped feathers as well as their exceptional hunting abilities. 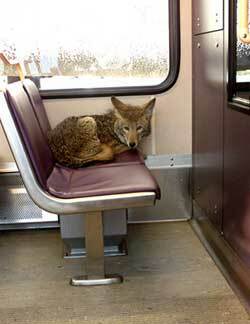 Coyotes have become common in suburbs and even cities. While they will eat trash and roadkill, they prefer fresh meat, so they are voracious, persistent killers of all kinds of small mammals. Once they learn that small dogs, cats and rabbits are plentiful fresh food sources, they thrive and reproduce in any suburban neighborhood (especially those with dry creek beds) more successfully than in the wild, growing larger and living longer. Coyotes have been known to wipe out entire colonies of feral, “community” or barnyard cats. Amazingly, they will also mate with dogs in southern regions. The “coydog” offspring are even more successful at predation and will attack livestock. (Another reason to spay/neuter your dogs!) Thank you to Dennis Maxwell/Port of Portland/AP Photo for this image. Your dog or cat was never found? If a owl or coyote catches your cat or dog, you likely won’t know their fate. Vet clinics only see those injured pets that were too large to be carried away. Your pet simply disappears, carried off to the nest or den where the hungry chicks or pups await. This predation is likely much higher than reported because of the lack of clear evidence, and predation should be considered a serious threat to neighborhood animals. Please be proactive with coyotes or owls in your neighborhood. Keep your trashcans tightly covered, your birdfeeders clean, and don’t leave kibble outside, to avoid attracting coyotes to your neighborhood. They can be attracted by the smell of food, just like your pets are, so keep your picnic and grill food covered. They will also feed on gardens and fruit. We had a daily coyote visitor during hackberry season for a few years. In large cities in Texas, coyotes have their own “superhighways” that allow them to cover cities quite thoroughly: creek beds. If your house backs up to a creek and you have pets, your pets are MUCH more likely to be coyote targets than pets in homes away from creeks. I can’t imagine that Texas is unique in having this problem, though creeks here tend to be dry much more often than in some other areas of the country, affording a below-ground-level dry pathway with just enough vegetation to allow critters to remain largely invisible.